The Radical Beauty Project is a collection of beautiful, high-concept photographs featuring models with Down's syndrome. Famous faces including Henri Cartier-Bresson, Indira Gandhi, Twiggy and Joanna Lumley have all been photographed by the American. Can you help solve the mystery of these 100-year-old photographs? People are now using social media to help identify the individuals captured in the photographs. Shah Marai, AFP's chief photographer in Kabul, was killed in a second suicide bomb after rushing to the scene of the first attack. 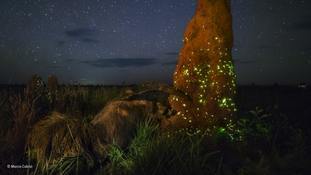 The night-time picture in a Brazilian national park features an anteater which experts have decided is a stuffed animal. After documenting Obama's eight years in the White House, Pete Souza has released a collection titled 'Obama: An Intimate Portrait'. World renowned photographer Rankin is hoping to change perceptions of what beauty is in a new series.